Vladimír Bukač is top Czech leading viola player. Born in 1964 he studied at both the Conservatory, the Academy of the performing Arts, Prague and Hochschule für Musik in Freiburg. Already during his studies he gained attention by being awarded prizes in several domestic and international competitions. After graduation Vladimír Bukač lived in Japan where he was engaged as both a soloist and chamber musician dividing his time between violin and viola. His viola playing has proved to be a particularly fruitful aspect of his career. In 1993 Vladimír Bukač has become a violinist and later a violist of the renowned Talich string quartet which has been considered for many years to be one of the world's finest string quartets, represents Czech musical art over the whole Europe, Japan, North & South America, South Korea, making records and giving master classes. 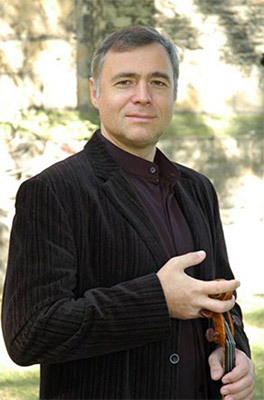 As a soloist and chamber musicians Vladimír Bukač has appeared in a number of prestigious venues and made a several acclaimed viola CD ́s, or some recordings for Czech radio or BBC. Some of his CD ́s were voted one of Classic CD magazine's "Choices of the Month" and was also praised with similar enthusiasm from The Strad, Gramophone. He plays a rare Italian viola built by Santini Lavazza and G.P. Guadagnini, Milan 1725/75.